This beautiful sofa is fully upholstered in full Italian grey genuine leather with contrast stitch for a luxurious feel to your home living space. This model features an electric recliner on both ends and four manually adjustable ratchet headrests for maximum optimisation. 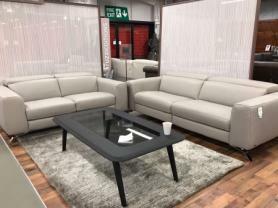 Made for us as our own range sofa by Natuzzi Group in Europe and fantastic quality. The recliners are fabulous, reclining away from the wall so no space required behind. The electric recliners are operated by heat sensitive finger control to adjust to your perfect position. Superb comfort from this high quality suite. Approximate dimenions: 350 cm x 312 cm. D: 110 cm.